Airbus A380-800. 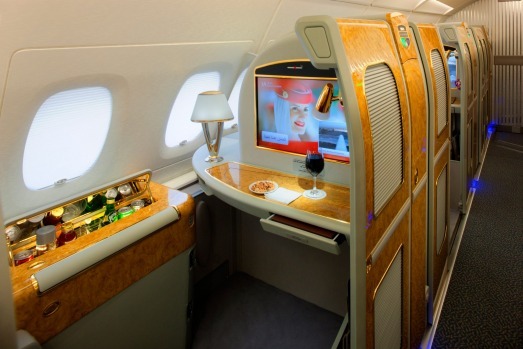 Emirates has 59 A380s in its fleet travelling to 35 destinations. 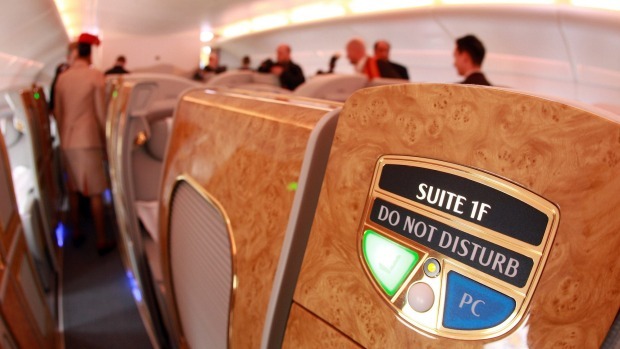 It has a further 81 A380s on order. 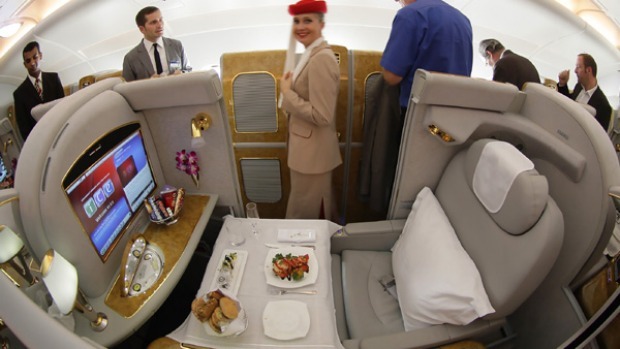 Emirates Skywards, but passenger can also earn Qantas Frequent Flyer points. 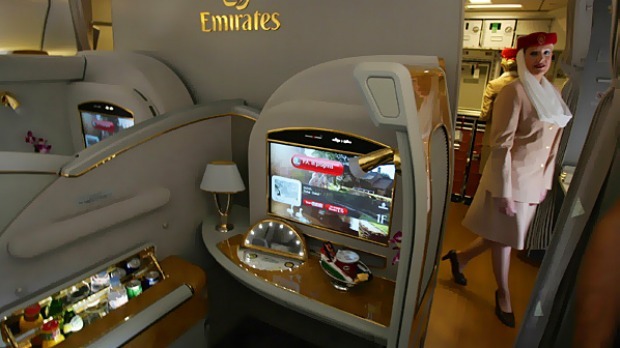 Emirates offers three daily flights from Dubai to Sydney and Melbourne. For the first time ever I couldn't wait to board and settle in a Private Suite that's a little like a luxurious cubby house in the sky. A sliding door creates a compact haven and there's even a "Do Not Disturb" sign when you want to be alone and a room service button on the phone when you don't.The layout is a one-two-one configuration with privacy screens if you tire of neighbour chit-chat. 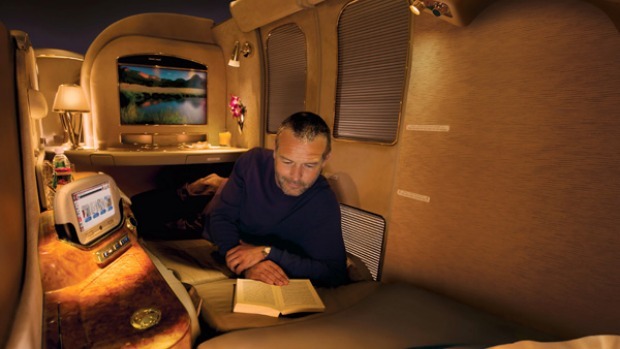 The roomy leather seat is well padded and, faster than you can say "another champagne, please" it converts to a flat bed stretching to 2.08 metres in length. 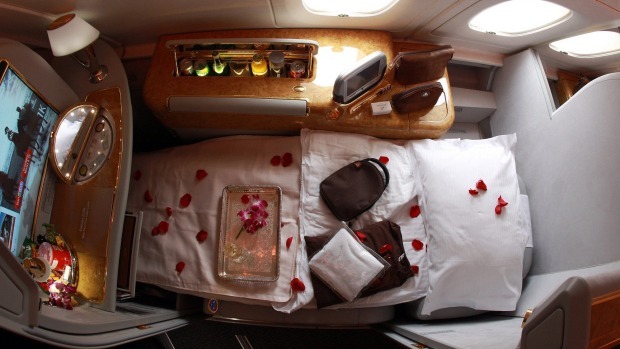 A light mattress, down pillows, cotton-lined blankets convert it to sleep mode and PJs and slippers are delivered in an Emirates tote bag with Bulgari amenities kit. 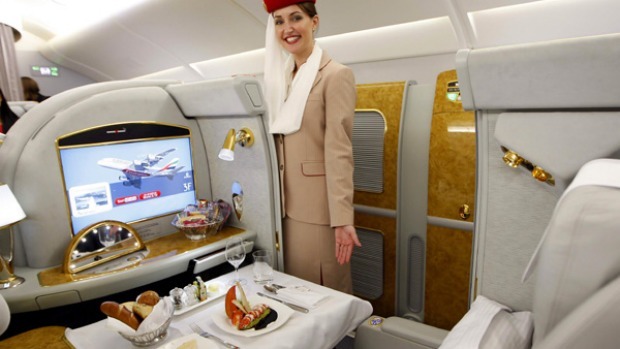 There's also a mini wardrobe, a pop-up mini bar stocked with non-alcoholic drinks that with the push of button rises after take-off and a wellness kit with lotions and potions designed to promote sleep. There's plenty of legroom and storage space with a snack basket full of goodies and a writing kit. Checked bags up to 50kg – a shopaholic's dream- and two carry-on items including one briefcase plus either one handbag or one garment bag weighing not more than 7kg each. The ICE "information communications and entertainment" system offers 2000 channels of movies, music and games, satellite phone services, SMS and email, live BBC news headlines and an air show map with external cameras.You can also wander down to the intimate first class bar for a drink and canapes. There's something weird and wonderful about getting your gear off 40,000 feet in the air and taking a hot shower so you are ready to face the world again feeling squeaky clean. 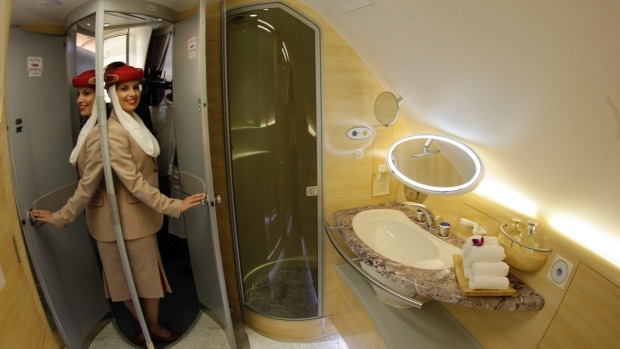 There are two shower spas at the front of the plane for first class passengers only, and your preferred time is booked soon after you board. The trouble is, you get in there and you don't want to leave: the heated floor warms your feet, while the five-minute blast of hot water completely revitalises you. You can stop the timer while you shampoo your hair then restart it. In case of turbulence there's a seat with a safety belt and an attendant just outside the door. The spacious bathroom is stocked with Timeless Spa and Bulgari products, a hair dryer, full-length mirror, large fluffy bath towel and a 15.4-inch LCD monitor that shows the live air show. You can spend about 25-30 minutes in the bathroom and when you leave, green tea and a small platter of fruit await. A glass of Dom Perignon 2004 champagne, traditional Arabic coffee and delicious dates, a hot lemon-scented towel and gourmet menus win me over in the first five minutes. Service is excellent, discreet and nothing is too much trouble – if you fancy a midnight snack of salted caramel tart or glazed duck breast – no worries. There's a cosmopolitan staff on board from 21 countries speaking 24 languages. First and business class passenger's fares include airport limousine transfers on departure around the world and on arrival in Australia. The service operates free within a 40km radius of Sydney and Perth and within a 60km radius of Melbourne and Brisbane. 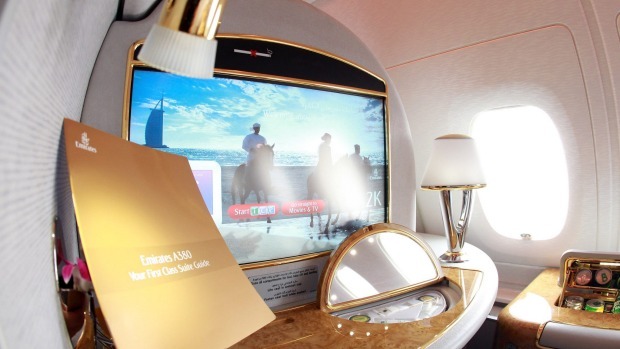 The Emirates First Class lounge in Dubai is also impressive with a la carte dining, bar, spa, showers and shops. A white linen tablecloth is spread and each course is served on Royal Doulton bone china plates with exclusive Robert Welch cutlery. 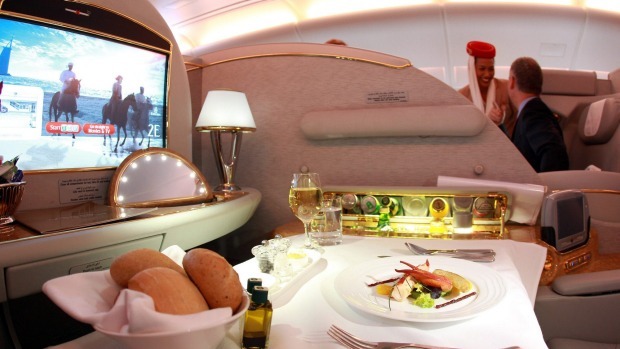 The first class menu is extensive and you can dine anytime you feel hungry. Living the dream, I order wild Iranian caviar served with mini blinis, chopped boiled egg, sour cream and lemon, followed by a fillet of salmon and seasonal salad and I couldn't say no to the chocolate panna cotta with almond brittle that tastes as good as it looks. The well crafted wine list features drops from France, Australia and New Zealand. For me breakfast is a fresh detox drink, fruit with good coffee and a croissant. 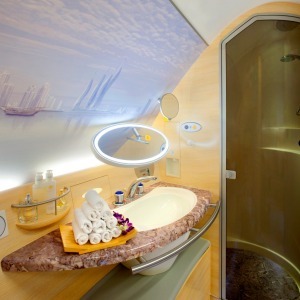 Soaping up high in the clouds is definitely a novelty but beware - fantasies of owning your own jet with a luxe bathroom set in quickly. Fingers crossed my numbers come up. Tested by Sue Wallace, who travelled at her own expense. 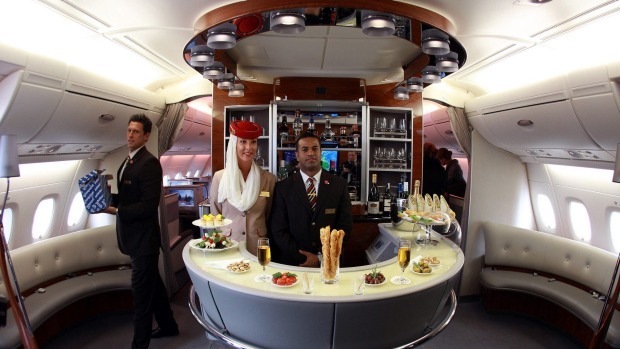 Take a 360-degree tour of an Emirates A380 superjumbo below.